Lindsey Schuler is an associate at Croker Huck and advises clients in a variety of transaction and litigation matters. Lindsey has worked with clients in the areas of corporate and business law, real estate, intellectual property, and civil litigation. Lindsey's real estate experience involves guiding clients through sale, lease, tax, and foreclosure matters. Lindsey's practice also includes representing clients in the drafting and negotiation of contracts to address their individual concerns. 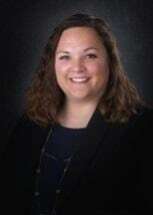 Lindsey joined the Nebraska State Bar in 2013 after receiving her Juris Doctor from Michigan State University College of Law in 2013 and her Bachelor of Arts from the University of Kansas in 2010. She is a member of the Omaha and Nebraska State Bar Association.